Wat Bowornniwet Wiharn, near the Banglampu market, in Phra Sumen Road is one of the more famous Bangkok temples with a long royal tradition. Built by Prince Maha Sakdipolsep, a son of King Rama III, the construction took eight years from 1824 – 1832. When the temple was completed, King Rama III invited then Prince Mongkut, future King Rama IV, who had entered the monkshood, to be the abbot. Please see map to the temple. It was here that he studied English and Latin from the early missionaries who came to Thailand. 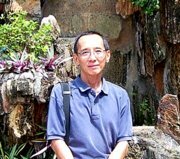 A keen student, he also studied mathematics, science and astrology and started a strict monastic order. The arched Chinese gateway, through the old temple walls, is studded with porcelain; carvings of Chinese warriors serve as guardians of the gate. 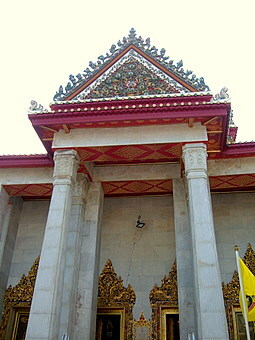 On passing the gate, the massive ubosot or ordination hall is the first building encountered. Like many temples built in the Third Reign, the roof and gables are of Chinese design. Two gold nagas or serpents and tall pillars line the entrance to the ubosot with the doorway and windows framed in matching gilded carvings. Canals dissect the vast and serene temple grounds where the former residence of Prince Mongkut, a three story European designed building, is located. The temple is also the home of Mahamakut Buddhist University, established later by King Rama V.
The significance of Wat Bowornniwet is that almost all the subsequent kings of the Chakri dynasty were ordained as monks here; King Rama VI, King Rama VII, the present king HM King Bhumipol Adulyadej and Crown Prince Maha Vajiralongkorn. 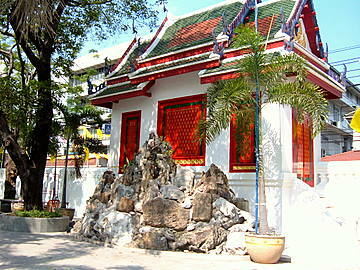 Wat Bowornniwet is in Phra Sumen Road just north of the Democracy Monument. 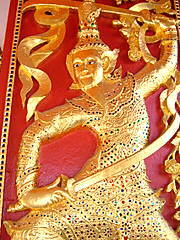 The Khao San area that’s popular within budget travellers is just 300m to the west of the temple. 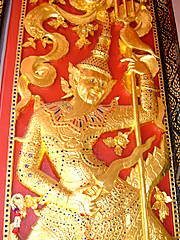 Other attractions nearby are Wat Chana Songkhram and Fort Phra Sumen. A convenient way to get there is to take the Chao Phraya River boat to N13 Phra Arthit pier (Banglampu), the walk along Phra Arthit road and onto Phra Sumen Road.